I’ve finally found the healthiest chocolate on the planet. The only chocolate company that does NOT commit the two deadly sins of chocolate manufacturing: high heat and cane sugar. The cacao bean, the botanical source of the chocolate bar, is in fact a super food. It is high in antioxidants, and loaded with minerals and even has a pleasant mood enhancing (some say aphrodisiacal) effect on the eater. After reading the dozens of research papers about chocolate, I realized it certainly has a place in a well rounded healthy diet. This is all good…but what happens when you process it into chocolate bars and candy shapes, like bunnies and eggs? This is where the problem starts. You see pure chocolate is bitter, I mean REAL bitter. That’s due to its high mineral and antioxidant levels. In order to make it palatable to the sweet tooth of the average person, most manufacturers add sugar. The sugar of choice is cane sugar, because it delivers a pure sweetness with no taste. Of course it may be certified organic sugar, but sugar, particularly cane sugar, is bad for your health in almost any quantity. In fact, I’m going to go as far as to say that sugar is one of the major causes of disease in the world today. Most honest and educated medical doctors will admit this and virtually all natural health practitioners will give you much evidence to support this claim. Certainly for the 21 million people in the US who have diabetes, and another 7 million developing diabetes each year, and the 57 million Americans with pre-diabetes, sugar is a death sentence. These are staggering numbers for sure. But chocolate, REAL chocolate, could be a real health benefit for all of us. The secret to making chocolate healthy for people is found in the ingredients and how they are processed. Let’s set sugar aside for a moment and talk about the next most destructive aspect of making chocolate: high heat. When you heat any natural botanical above 115 degrees Fahrenheit you begin to rapidly destroy all the vitamins and antioxidant properties of the food. The naturally health giving properties of the food are not only destroyed but often transformed into carcinogenic (read cancer-causing) substances that are very harmful to your health. It is well known to food scientists and nutritionists, when you introduce heat, light, or oxygen to volatile oils which are found in all botanical foods in some percentage, they transform into free radicals that become carcinogenic. I’ve looked at all the certified organic chocolate on the market and they all either add sugar or heat their products above the 115 degree threshold or both…except one. All of these details were to bring home the significance of how unique this company and their products are. The company is Sacred Chocolate, the brain child of raw food and nutritional pioneer, David Wolfe and his partner, Steve Adler. 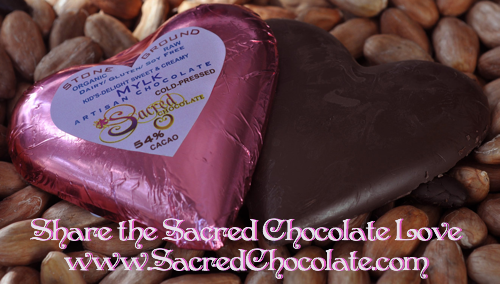 Their company, Sacred Chocolate, LLC is one of kind. I discovered them a few weeks ago and after pouring over their website, http://www.sacredchocolate.com, I immediately made my first order, which was a sampling of eight or ten of their creations. I received the painstakingly packed box of divine delectables on Friday after a call to the company to make sure that the chocolate would be delivered before the weekend and Mothers Day. I was assured by the Sales Manager, Mike Z. that the package would arrive before the weekend and that it was going to be sent FedEx to insure that it did not get damaged in shipment due to the heat. It should be noted that I didn’t request FedEx delivery, but Mike Z. told me that they did that to make sure that we wouldn’t have any damage to the sacred contents. Upon receiving the package I was very impressed with the care and thoughtfulness of the package. It was boxed in a thick box, with a bright orange label on outside that read, DO NOT IRRADIATE! ORGANIC FOOD, followed by the Federal law that prohibits the irradiation of certified organic food. That’s the first time I had ever seen any company do that. I thought that was pretty impressive from the start. As I proceeded to open the package, again I was impressed by the way they packed it. The first thing I saw upon opening the box was a shiny silver padded radiant barrier bag which is designed to keep the coolness in and the heat out. Inside the radiant barrier bag was a layer of paper padding on the bottom and the top. Under that, was two cold packs, two on the top and two on the bottom, then the sacred morsels where uncovered in a tightly packed and padded inner cavity. WOW! Obviously, they had given this whole process a lot of thought. I couldn’t wait to taste the product of all this thought and loving care. Each variety was carefully hand wrapped, in a uniquely colored foil, with full ingredients and all certification seals indicated on the label. All ingredients are either certified organic by CCOF (California Certified Organic Farmers) or wild crafted and they are clearly marked on each label. If you have never tried raw chocolate or eaten raw cacao nibs before you are in for a surprising treat. It is different, but wonderfully so. The Sacred Chocolate flavors are all wildly unique and smooth tasting. They currently have 22 flavors in four different categories: Plain, Exotic, Therapeutic, and Diabetic Friendly. Go to their website http://bit.ly/9910SL and learn all about organic, raw, health-giving, chocolate. Their website contains a wealth of authoritative research and articles about the nutritional benefits and properties of raw organic chocolate. It will be an adventure that you will never forget. As their in-package greeting card says, “Handmade with Love and Gratitude”. I think that about sums it up. Enjoy!